Lately, we've asked outdoor enthusiasts to take action on a few big bills, including the omnibus spending bill and now, the Farm Bill. The Farm Bill is a bill that directs a lot of what happens at the Department of Agriculture. As you might know, the Forest Service lives in the Department of Agriculture, so some sections of the bill deal with forestry. In recent years, Congress has passed most legislation through major packages, rather than dealing with bills on an individual basis. These package bills become a way to slide other provisions in under the radar. We want to flag that there are a few major public lands issues that lawmakers are trying to sneak into this package. In the last week, a few lawmakers have worked these back channels to introduce provisions into the Farm Bill that will undermine the public process on public lands, damage land management decision making, and harm backcountry recreation through attacks on the Roadless Rule. 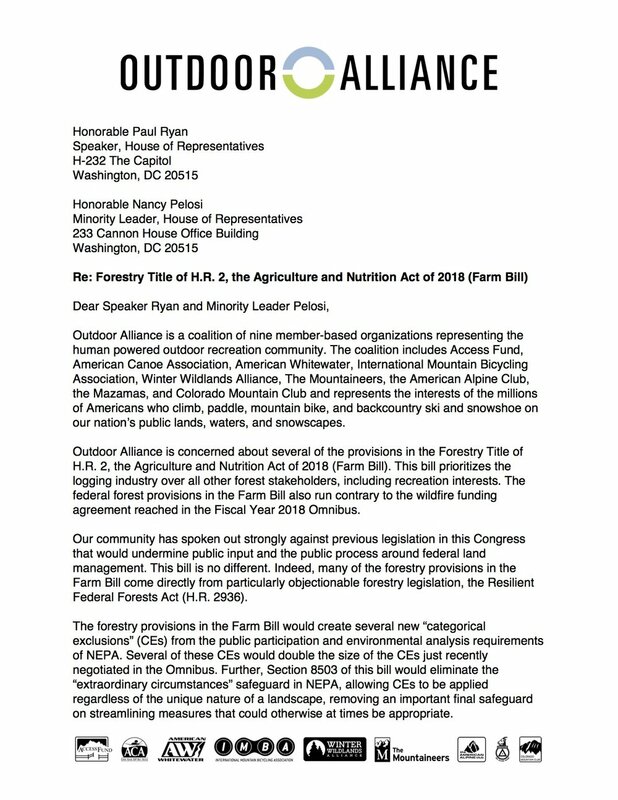 Outdoor Alliance recently submitted comments to Congress about the Farm Bill, which could pass as soon as this week. What does the Farm Bill have to do with outdoor recreation, you might ask? Aspects that could undermine the public process on National Forests. Wildfire funding saw a fix in the recent omnibus spending bill, but the Farm Bill contradicts some of those provisions. Undermines the Roadless Rule, which we have gone to great lengths to defend since it protects some of the country's best outdoor recreation.